As if an alcoholic drink ad on a hot summer's day is not enticing enough, this billboard not only features enticing imagery of a glass of Pimm's, but searches local pubs and beer gardens for seating space and tells you how to get there. Brand owner Diageo has launched its sensor-activated out-of-home digital poster push in partnership with a number of Taylor Walker pubs in London’s Victoria and The Metro restaurant and bar in Clapham. 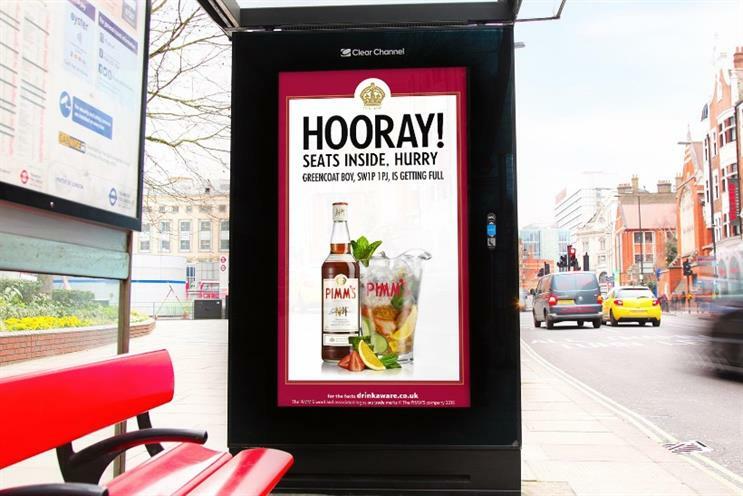 The ads activate when the temperature reaches 16 degrees Celsius – similarly to Pimm’s OOH campaign launched last month – and uses a beacon network installed at pubs that counts the number of smartphones at the venue. Occupancy is measured at five-minute intervals so that if the space is full its details are removed from the advertising. Weather data is also used to shape the messaging of the ads. The outdoor locations are focused around transport hubs. The campaign is running on a trial basis until early next month.